Well, the saga of the Earl Grey Cinnamon Braggot continues. 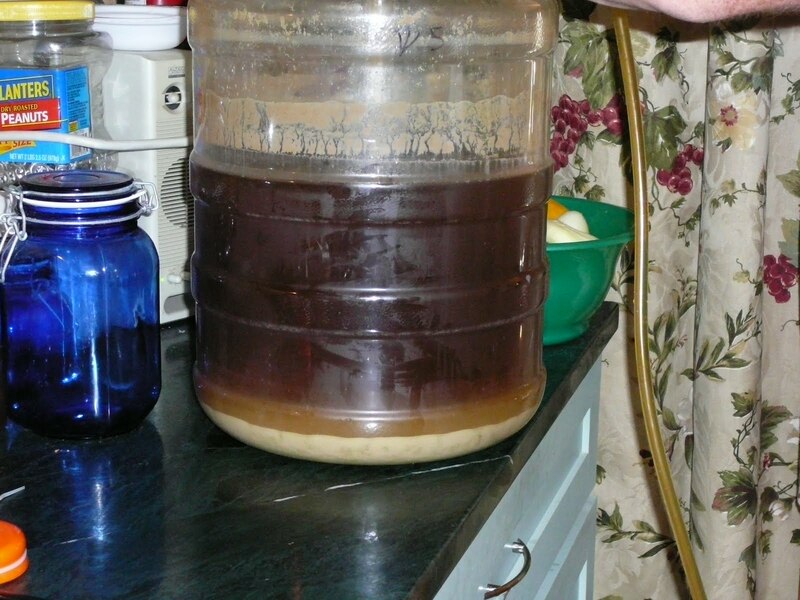 Since I had to pitch this on a yeast cake from the Vulcan Warrior due to poor Nottingham yeast (don’t get me started on that, I am done with Notty for now), the braggot is pretty cloudy. So I figured I would take a note from Bill Cosby and toss some Jello at it. Well, not really Jello, but gelatin, Knox to be specific. Here is what I did. 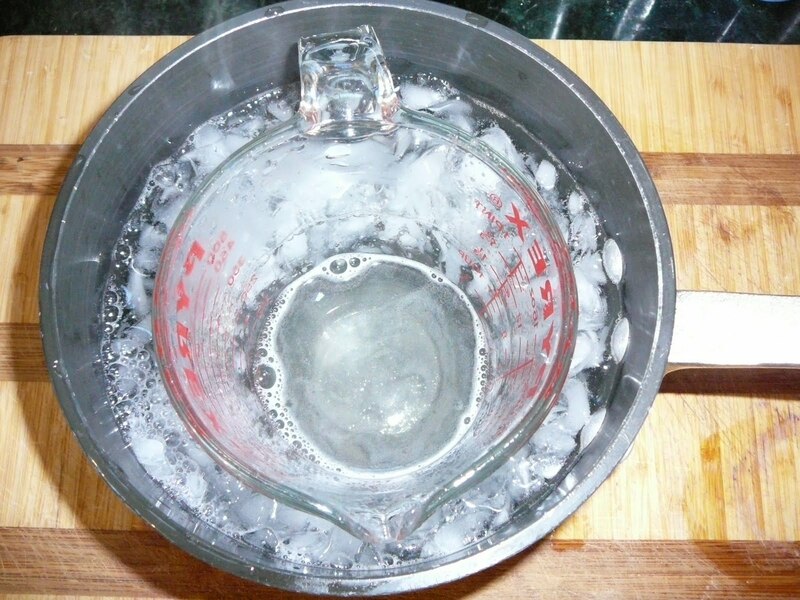 Mixed one tablespoon gelatin per five gallon batch with 1 cup of water per tablespoon hot tap water in a measing cup. Stired it up and let it sit for 20-30 minutes. I heated the mix on the stove until it looks like was going to start boiling then killed the heat. 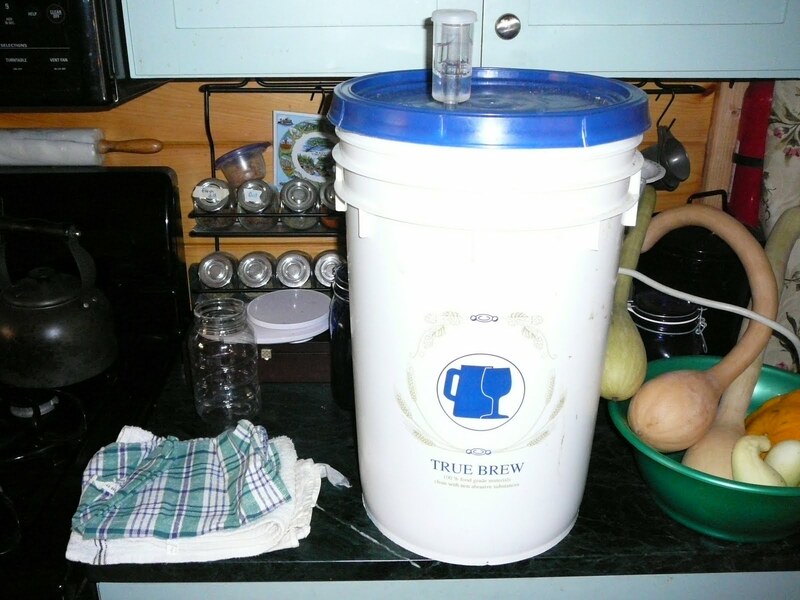 I cooled the mix in an ice bath, then added it into my tertiary, then racked my braggot onto that. The pre gelatin looks clearer than the post gelatin because I was sloppy with the racking. I figured the gelatin will clear up my sloppy racking. Off to the basement for an ice cold water bath for a few days at least. Today is bottling day for my Vulcan Warrior IPA. I figured I would document my procedure for bottling, I find it pretty stress free and I haven’t had any problems since I started doing it this way. 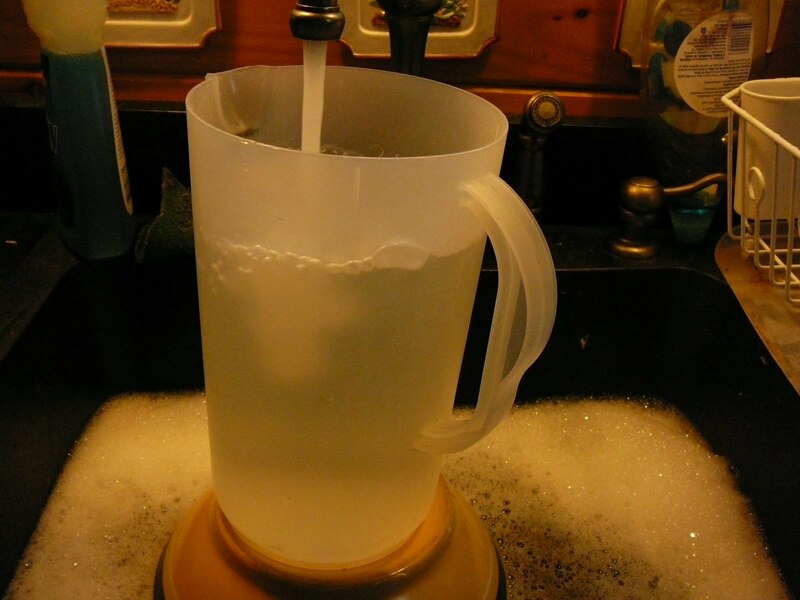 I usually mix up 3 gallons of water to two teaspoons of Iodophor and put that in my rubbermaid bin along with any equipment I am going to use. 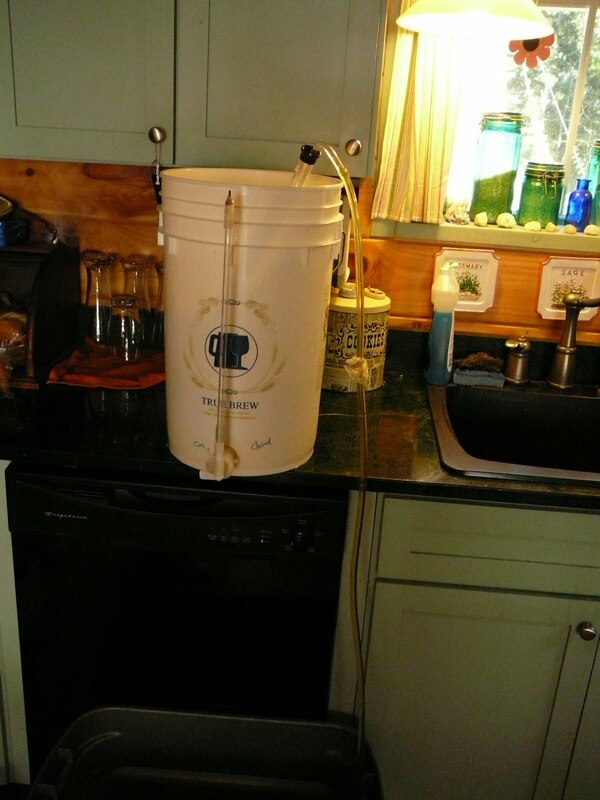 My equipment usually includes: hydrometer and sample jar, wine thief, autosiphon and hose, bottling bucket, spigot, small cup, vinator, spoon, and sponges dedicated to homebrew use only. 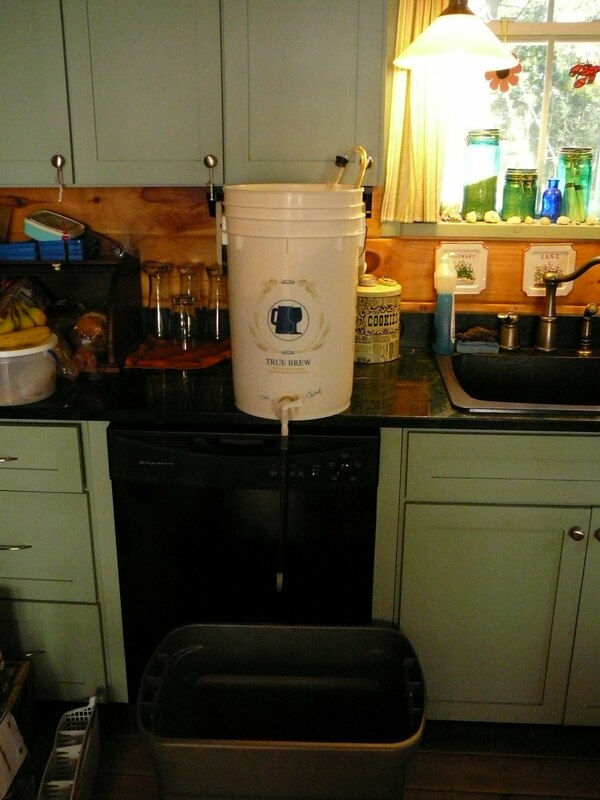 My fermentation vessel is already on the counter from the night before. I also like to wash the kitchen, do the dishes, wipe the counters, etc. 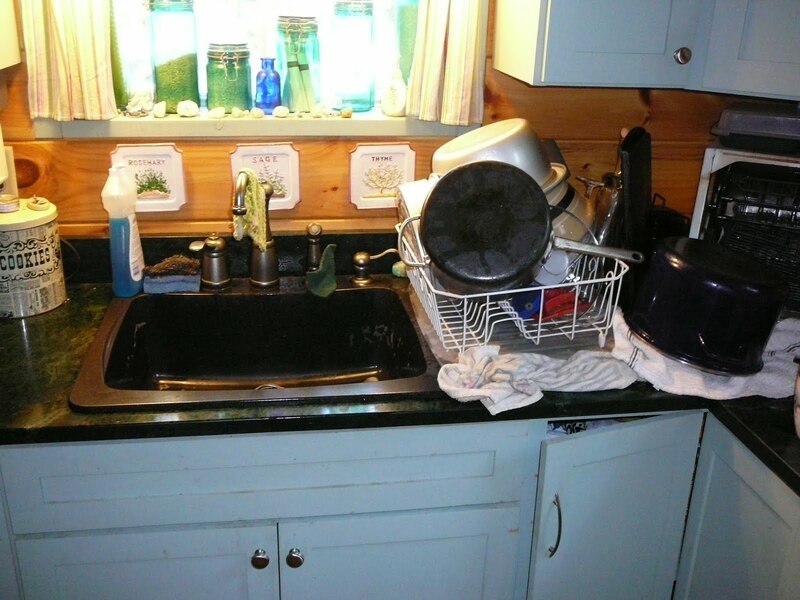 If I cl ean the kitchen and leave the kitchen clean after I am done, I figure there is less chance of annoying the wife with my messes and I can continue using the kitchen for my activities. She actually likes it when I bottle since the kitchen gets a good cleaning. I get all my supplies in order. Caps and priming sugar is what I needed today. 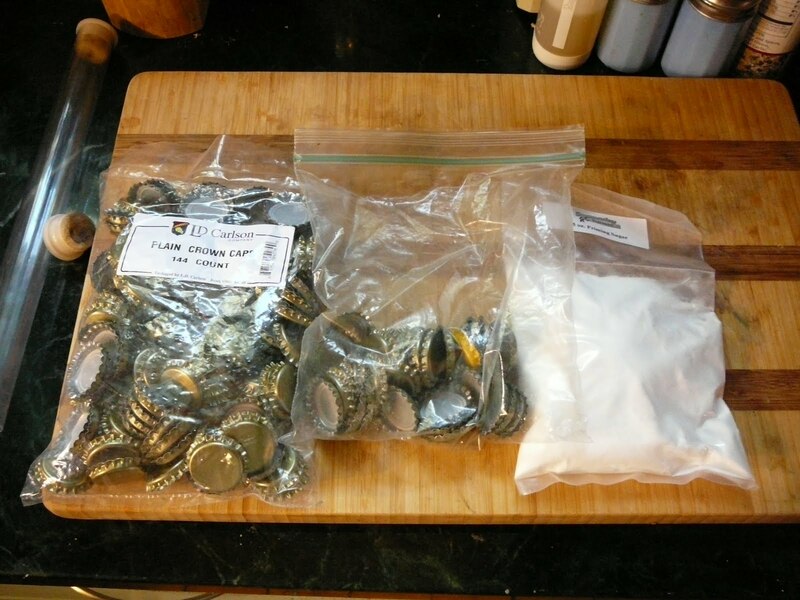 I usually get 52 caps out and 1 oz corn sugar per gallon of beer. I heat 1 pint of water to boil, stir in the corn sugar and boil for 10 minutes and let it cool as I do other things. 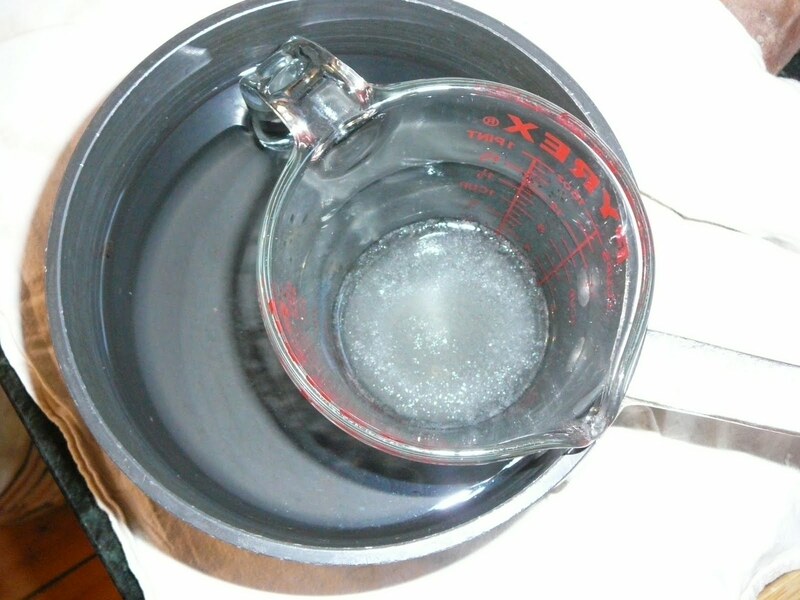 Like dump the Iodophor solution into by bottling bucket and run some throu gh the spigot and some through the autosiphon. 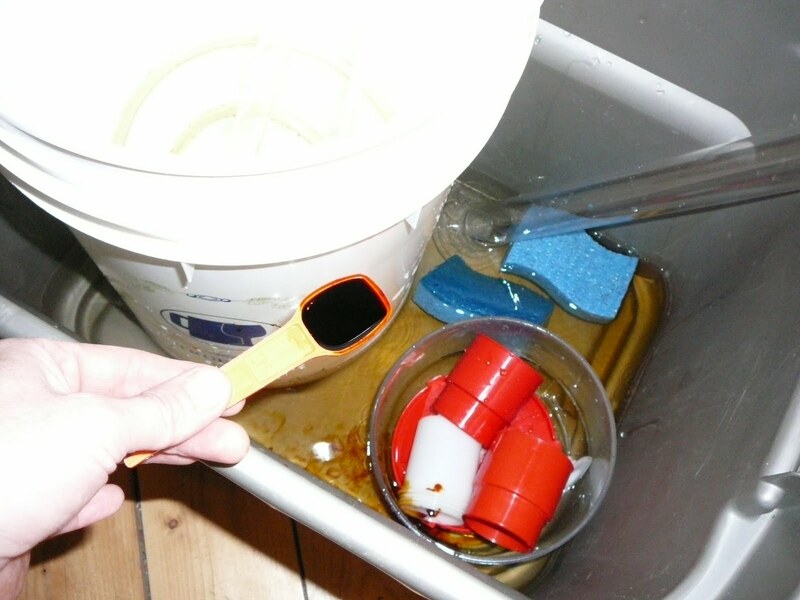 I take a gravity sample and check out the color and smell. I usually put the sample in the fridge to cool off to take a cold taste. I put the priming solution in the bottling bucket after I swish Iodophor all inside it and drip dry for a few seconds. 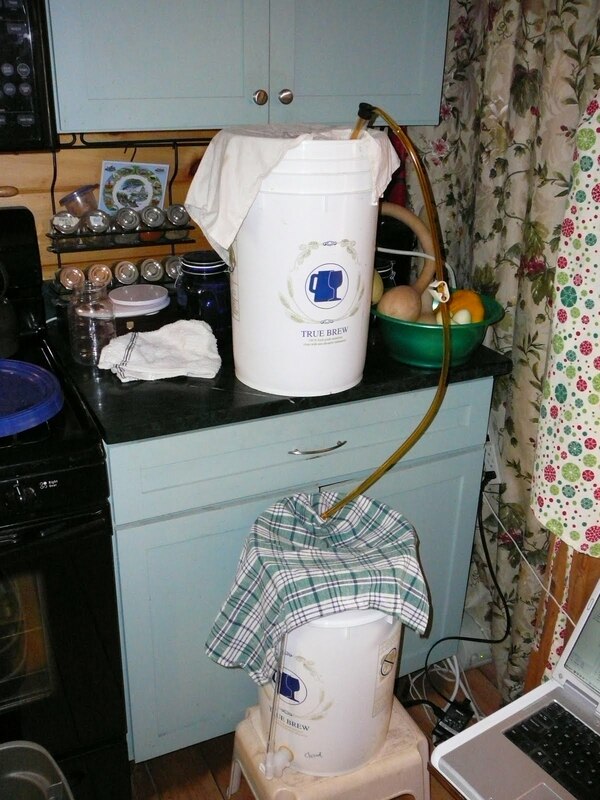 Then I insert the autosiphon into the beer, cover it with a cloth, insert the hose down to the bottom of the bottling bucket and cover that with a towel as well, and I begin siphoning the beer into the bottling bucket. Yes, my computer is at the ready in case I have any questions as I go and to supply the tunes as well. 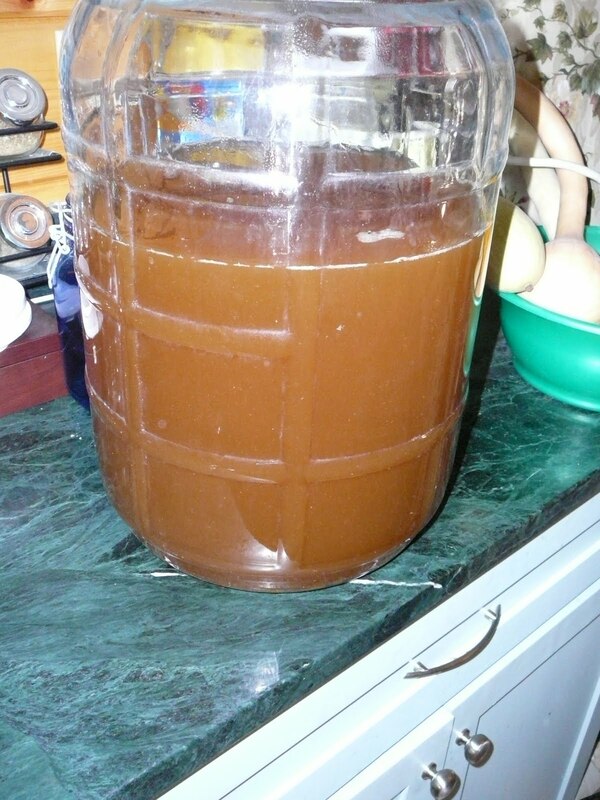 While that is siphoning, I begin processing my bottles. 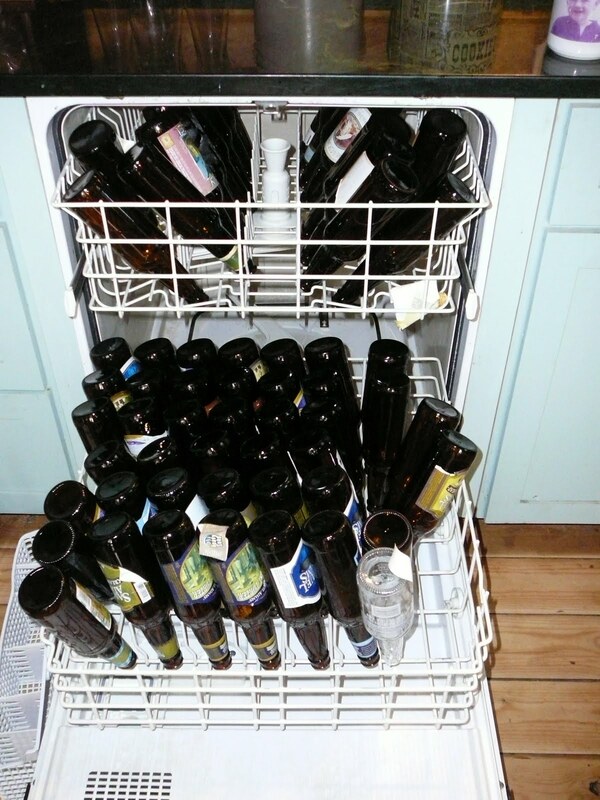 I run my bottles through the dishwasher. I have a high temperature setting and a pots and pans setting on my dishwasher so I use them. I put Oxyclean in the detergent holder and use no rinse agents. I also use heat dry. 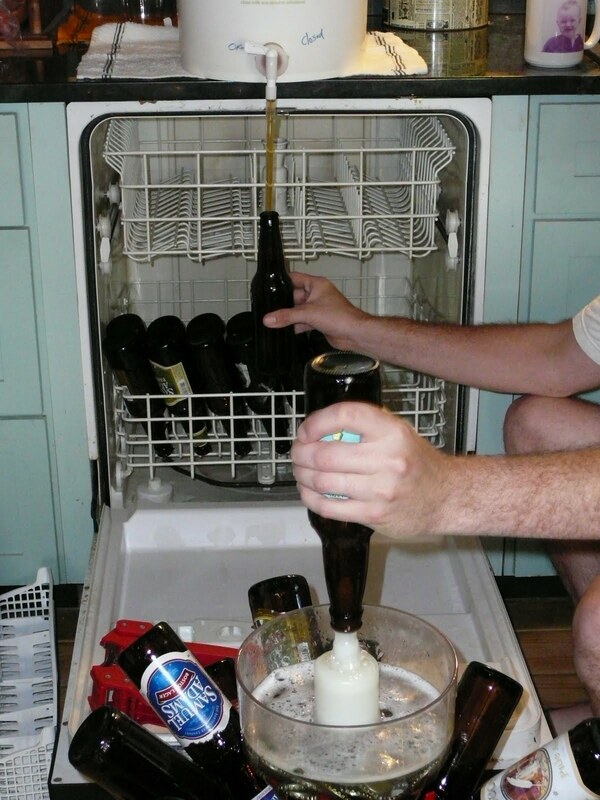 This process takes a couple hours in my dishwasher so I have to plan accordingly. 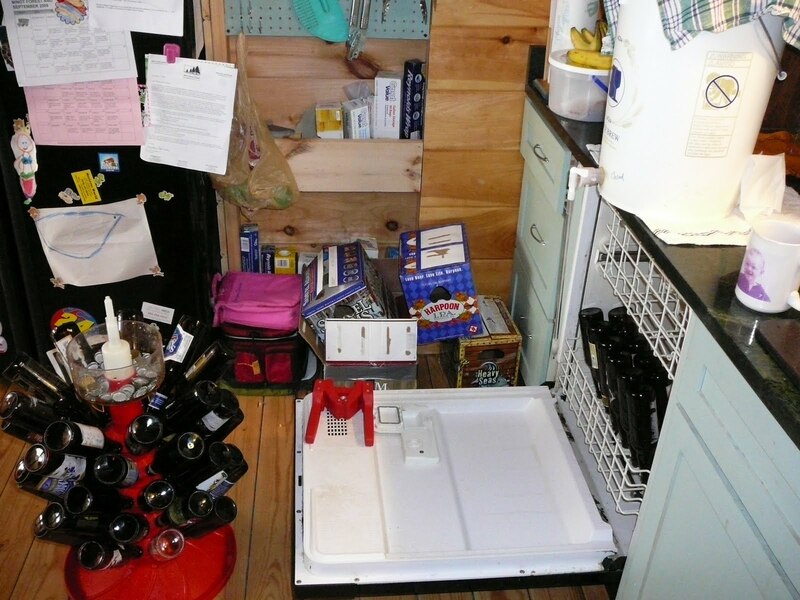 One by one, I inspect the bottles as I take them out of the dishwasher, then I give them three squirts with the vinator and hang them on my bottling tree. This was a tremendous deal at $15 off Craigslist! And here we are all ready to start the assembly line. 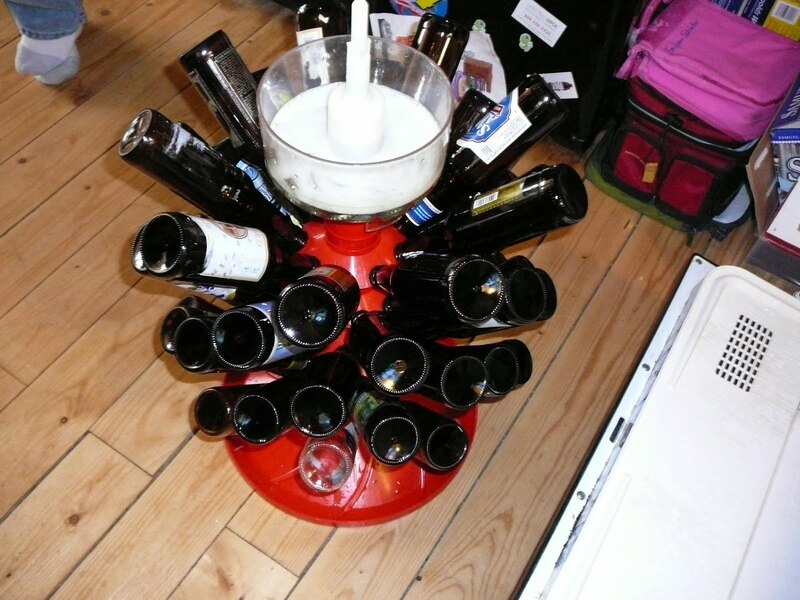 One bottle fills in one hand while I take a bottle off the bottle tree and give it three squirts. 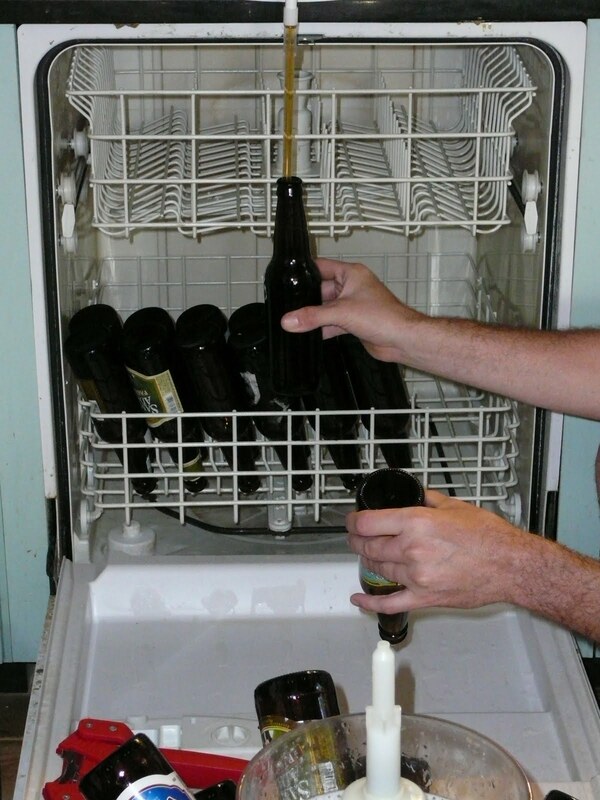 Then that bottle drip dries over the dishwasher lid until the filling bottle is full. 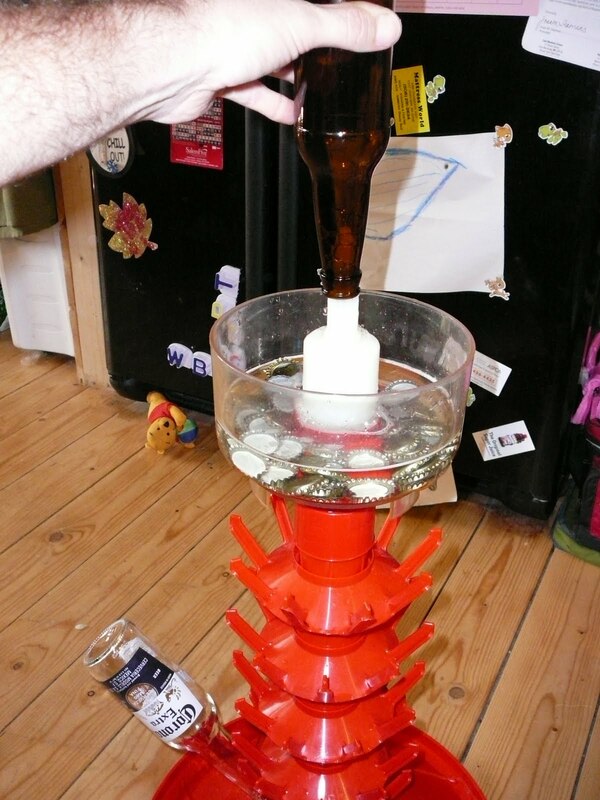 Then I replace the full bottle with the empty bottle, put the full bottle down on the floor and slide a cap out of the Iodophor in the vinator and slip it over the top of the bottle. Then repeat. And repeat. And repeat…..
Then without even moving, I can cap these bottle and put them in their storage cases to sit at room temperature for three weeks. 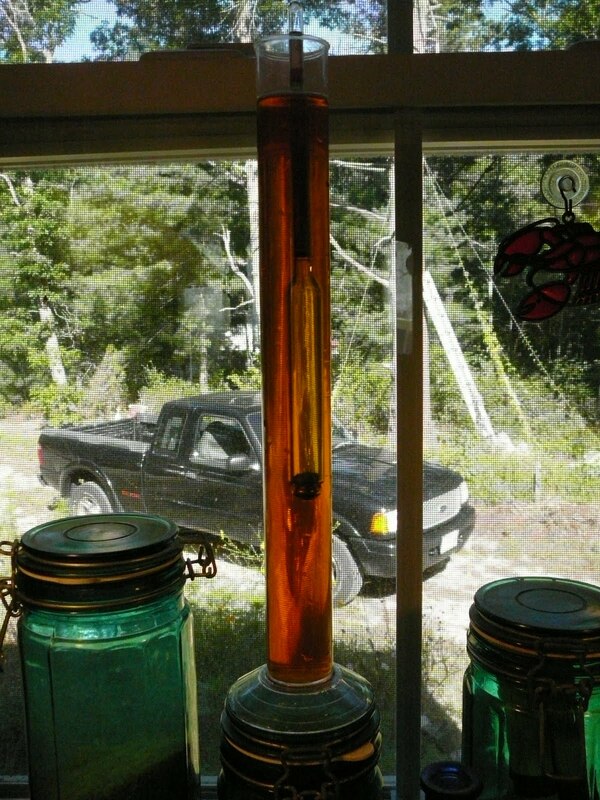 I like to bottle one beer in a clear bottle. I put it on the shelf in my kitchen, safe from light. 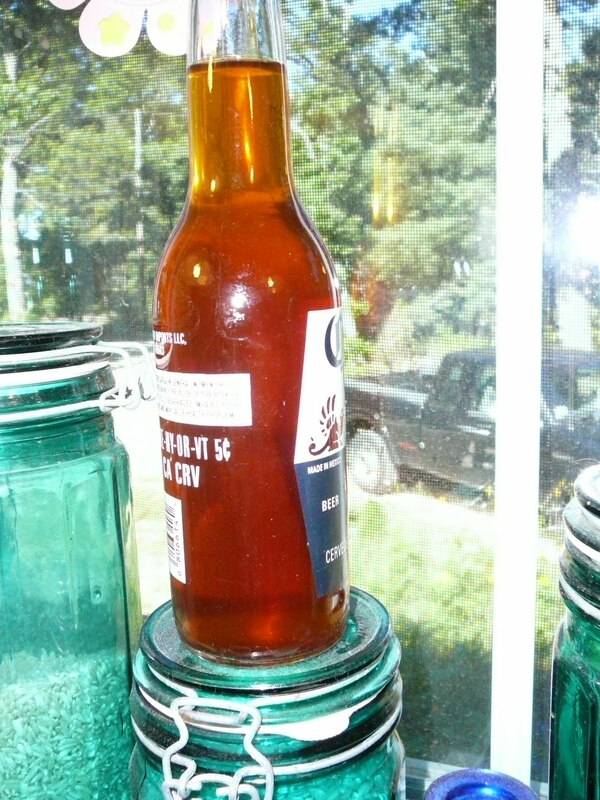 With the clear bottle I can see how the sediment develops as carbonation happens. I also enjoy making the difference in a less fortunate bottle’s life. 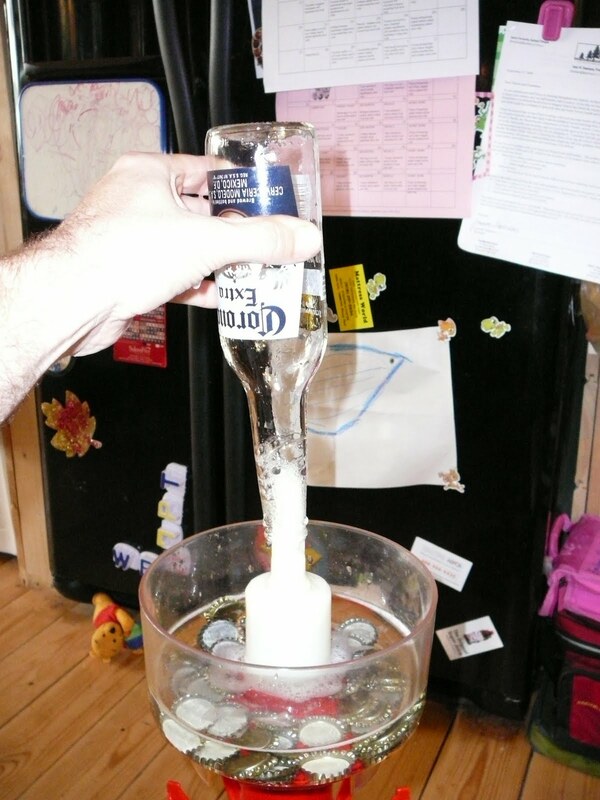 That is one happy Corona bottle to be finally filled with real beer. 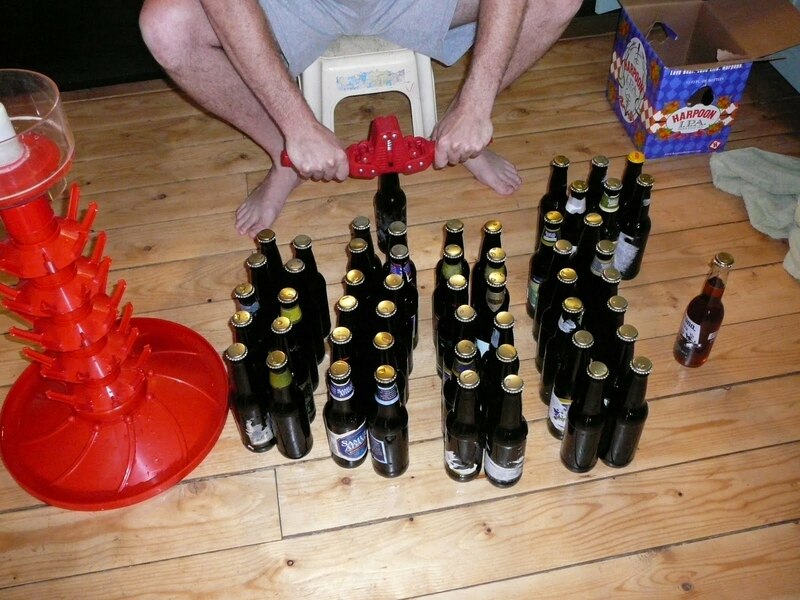 As you can see, you really don’t need to stress out about bottling. Sure, I would love to be able to afford kegging but I bet if you add up all the line cleaning, keg cleaning, CO2 bottle filling and everything else, there really isn’t a huge time savings in kegging. Plus my beer is easy to transport and I can have an unlimited number of my beer styles in the fridge ready at any given time. 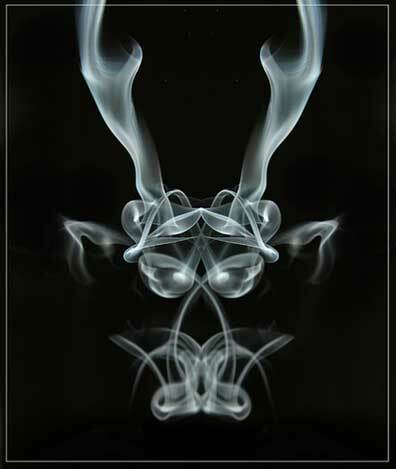 The Vulcan Warrior IPA had a FG of 1.017. I don’t know where I started. The Brix was 13.2. But then I did that cascade addition so I have no idea what the OG would be. Based on the FG, this should be 6-7% perhaps? My Vulcan Warrior IPA (the big brew IPA) is on the counter, ready for some bottling action tomorrow. I think I can squeeze it in before the day gets busy in the afternoon. If you remember from earlier posts, this is the one I did my flavoring experiment with. I boiled up 1 gallon of water and 1# of DME with cascades, chilled, and pitched onto wort that had been fermenting for 1 day. The fermentation was incredible, good thing it was in my Better Bottle , the top interior of which is plastered with hops residue right now. That will be a job for OxyClean. Next up will be the Braggot. I hope the Nottingham lag didn’t hurt that beer. The garden was disappointing this year. Some things did well, and others just horrible. First it was the onslaught of the slugs. 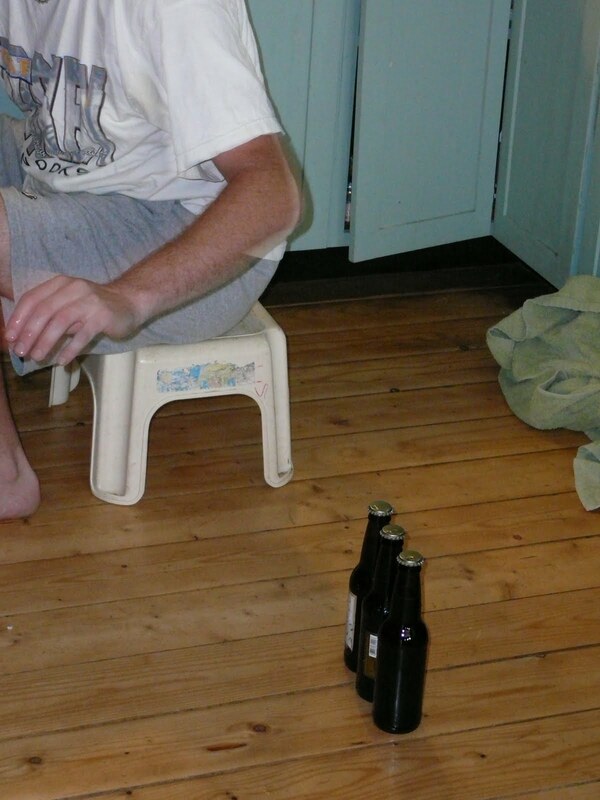 I couldn’t get enough beer traps in my garden to trap them all…just horrible. Devasted my cabbage, hurt the beans at first, ruined mid season kale. Beans did awesome, should have planted more. Planted the pole beans in the wrong place, did poor. More shaded this year than it was last year. Peas did ok. Didn’t plant a ton. Squash did ok. More romanescos and patty pans then ever before. Not a single eight ball. tromboncino’s were not as prolific. Better than usual for green striped cushaw. Not so great acorn squash crop. Decent start to sweet meat squash then borers got in and they didn’t get a chance to grow very big. Kousas didn’t do well at all, still a blossom here or there but the fruit gets the blossom end rot. Early kale was awesome, mid season kale was not worth picking due to slug holes. Looks like I’ll get some more good harvests late season. Turnips look great, harvest soon. Eggplants just now have decided to blossom…too late guys. Cabbage is eaten all to heck. Was looking forward to homemade sauerkraut. Gooseberry crop is just starting and it looks to be a good harvest. Tomatoes were awesome, then the early blight hit. Looked like we were past that and tomatoes starting coming…then late blight hit. Got some hops, pretty good for first year. Got one small potato from the grocery store potatoes that went to seed. Carrots don’t look to be too good. A lot of greens then just little tiny carrots. Lettuce did great but there were a few species in the mix that were bitter. Try for some head lettuce next year. No sunflowers again this year. I don’t get it. Amaranth did well, didn’t plant enough though. Chocolate mint did great for a first year planting. Basil did alright, the early wet and lack of sun stunted them a bit. Need bigger pots next year. Slug control early and often. Treat for blight early and often. Plant pole beans in more sun. Plant more beans with less dense planting. Stagger plantings. Expand garden bed to use both sides of the trellis I built. Spread squash plantings out more. Plant gooseberries together in a bed with a trellis. Thin kale patch out a little. One free chest freezer was scored by my wife! Now I can do lagers and control temperatures for my ales better…well, once I get a controller. Now…which controller to get. My wife’s birthday present to me finally came! 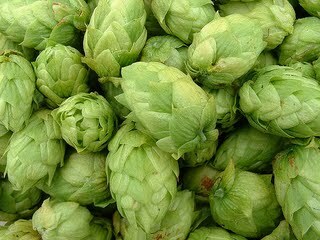 I’m really excited about this brew, I’m hoping to be able to do it soon! Heavy action in the airlock still. Hope the lag didn’t do too much damage.